What better way to welcome the start of summer than fireworks, music, drinks, bonfires at the beach, and an overall festive and jolly atmosphere? That’s exactly what you get, and then some, on June 23 for Sant Joan when the whole city prepares itself for one of the most emblematic and jovial parties you will find in Cataluña year-round. Young adults and party-goers converge on the beaches of Barcelona late at night to mingle, drink, sing, and be merry - all in anticipation of the majestic firework show organized by the local Catalan government. In many of the plazas and streets of Barcelona you can witness breathtaking fire shows with people dressed in mythical and elaborate costumes, playing out themes of good vs. evil, creation and rebirth, all very fitting and representative of summertime and the start of a new bountiful season. And, the warmth and wonderful temperature incite most everyone to venture outside to partake and celebrate in one way or another. 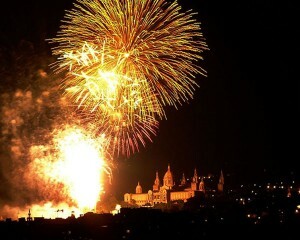 The first years I celebrated Sant Joan, the beach was always my destination. But last night I decided to take a different approach and sought out the terrace of Hotel 1898 Barcelona to get an all-encompassing point of observation. Hotel 1898, besides being located very central, just off Las Ramblas, has one of the best views of all of Barcelona. In fact, I recommend taking it all in at any hotel rooftop terrace, the taller the hotel, the better. And the best way to accompany the firework show is with an ice-cold sparkling glass or bottle(s) of cava. Go ahead, you deserve it. Warning: if you aren’t the type of person that enjoys fun stuff, get yourself a pair of earplugs because fireworks, firecrackers, and the sheer noise of party revelers make it a very noisy and rowdy night. Other things to know and try: La Coca de Sant Joan. This delicious pastry is customarily consumed on the night of the 23rd and is typically accompanied by a nice fruity wine such as muscatel or a glass of cava.